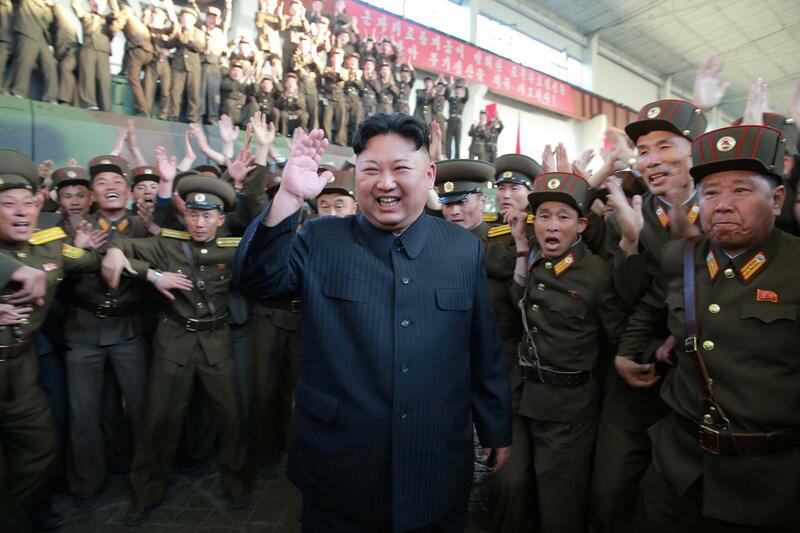 North Korea’s leader Kim Jong Un and his military officers celebrating achievement. But he also struck a conciliatory note, opening the door to dialogue with South Korea and saying he would consider sending a delegation to the Winter Olympics Games to be held in his southern neighbor in February. But Kim, dressed in a Western-style gray suit and a tie, said it is imperative to lower military tensions on the Korean peninsula and improve ties with the South. He said the path to dialogue was open and that he would consider sending a delegation to the Winter Olympics Games in Pyeongchang, South Korea. “North Korea’s participation in the Winter Games will be a good opportunity to show unity of the people, and we wish the Games will be a success,” he said, according to a Reuters translation of the speech. “Officials from the two Koreas may urgently meet to discuss the possibility.” South Korean President Moon Jae-in has said North Korea’s participation will ensure the safety of the Winter Games, and he proposed last month that Seoul and Washington postpone annual joint military drills until after the Olympics. The idea of improving relations between the two Koreas is one that is frequently spoken about but seldom achieved, and Kim’s warmer words could also be seen as an attempt to drive a wedge between Seoul and Washington. “We’ll see,” said President Trump on Sunday night when asked about North Korea’s nuclear claims. Daryl Kimball, executive director of the Arms Control Association, said Kim’s claims about his country’s nuclear capability underscored that there was no viable “military solution” to denuclearizing North Korea, and sanctions alone would not convince Pyongyang to halt or reverse its nuclear buildup. “To avoid a nuclear conflict and the full-scale deployment of an operational North Korean strategic deterrent force, U.S. leaders, in concert with South Korea, should redouble efforts to engage North Korea in direct talks and cease any further explicit or implicit threats of military action against the North,” he said in an email. “The upcoming Olympics provide an important opportunity to break the ice and to begin discussions with the North Koreans on mutual steps that reduce the chances of miscalculation and war,” he added. In the speech, Kim also stressed North Korea’s economic achievements and noted the importance of improving the nation’s standard of living, the AP reported.